Organised by the computer science department of ETH Zürich, this conference was a celebration of the life and work of Niklaus Wirth on the occasion of his 80th birthday. 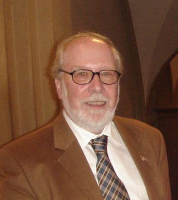 Niklaus Wirth was a Professor of Computer Science at ETH Zürich, Switzerland, from 1968 to 1999. His principal areas of contribution were programming languages and methodology, software engineering, and design of personal workstations. He designed the programming languages Algol W, Pascal, Modula-2, and Oberon, was involved in the methodologies of structured programming and stepwise refinement, and designed and built the workstations Lilith and Ceres. He published several text books for courses on programming, algorithms and data structures, and logical design of digital circuits. He has received various prizes and honorary doctorates, including the Turing Award, the IEEE Computer Pioneer, and the Award for outstanding contributions to Computer Science Education. Details of the talks are available here. The many areas of computer science they encompass indicate the extent of Wirth's legacy in research today. Thanks to the generous support of the ETH Computer Science department, the event was free for all participants. Slides and video recordings of the talks are available to view and download from our programme page. Galleries of photos taken throughout the event can be found on this page. The symposium was organised by the Chair of Software Engineering at ETH Zürich.